Deer Valley is a consistently difficult trail that connects Highways 4 and 88. While the trail is run in either direction it is most difficult from South to North. The trail boasts some great views and landscapes from its mountain tops to it's valleys. Pit toilets and fire pits are available at Hermit Campground without a fee. Deer Valley is a must do trail if you are in the area. It can be run out and back in one day or driven straight through. To get away and take advantage of the great valleys and meadows you may consider camping near one of the to stream crossings. Although you would be better off in Hermit Campground during late Spring till mid Summer, do to the large number of mosquitoes. Just remember to bring some wag bags and pack everything out. Trail Access (Southern) - The trails Southern access point is within Hermit Campground, literally twenty feet from our campsite. The trail is well marked and located in the Northeast corner of the campground. Gatekeeper - The first obstacle you will come across, traveling South to North, is arguably the most difficult on the trail that does not offer a bypass. There are two lines on this section, a high line to the North side and a low line to the South. The high line will leave you feeling a little tippy do to the drop off the back side of the large rock. Use caution and a spotter while navigating the high line. Getting too close to the center of the trail could lead to being high centered or even a roll over. The lower line is much more stable although it will most likely require at least one traction device. Wedge Rock Climb - This fun little climb takes you up a small rocky hill that is shaped like a shallow "V". With some good spotting it is possible to get a stock or slightly modified high clearance vehicle up the hill. 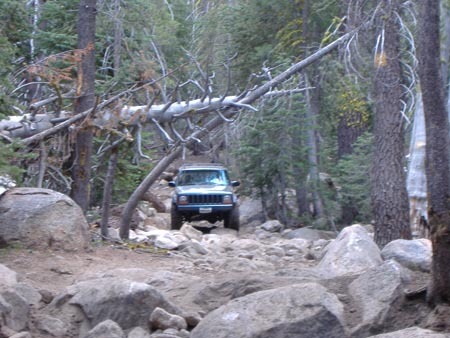 Off Camber Rock - The entire trail is filled with several medium sized rocks to challenge drivers and vehicles. This particular section has a rock ridge in the center that could push you off camber if you are not careful. Rock Garden - This section of the trail offers the longest rock section with a decent little drop near the Northern end. From the rock garden it is a short distance to the Southern water crossing. Water Crossing (South) - The Southern water crossing, Deer Creek, is a great place to camp or just relax and get a bite to eat. This valley is known as Deer Valley and is where the trail gets it's name. Just remember that the mosquitoes can eat you alive until mid to late summer, bring plenty of repellent. Water Crossing (North) - The Northern water crossing, Blue Creek, is much deeper then the Southern crossing. Keep your speed slow and constant to avoid pushing any water into your intake. This valley offers some great camping and scenery along the trail. Trail Access (Northern) - The Northern access point is located at the Southeastern end of Lower Blue Lake near the dam. 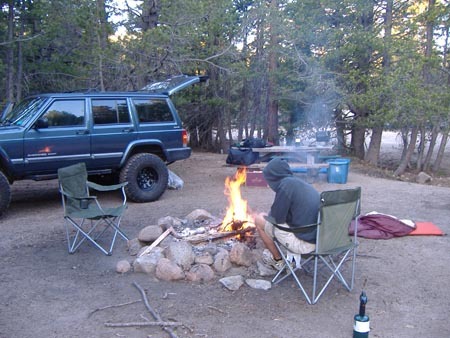 Camping is available near the trail head at Lower Blue Lake Campground. Traveling the trail from this direction is less difficult because it is down hill.